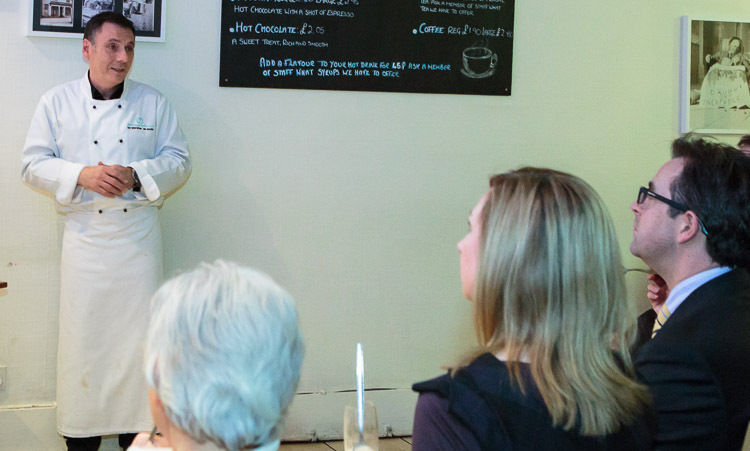 It’s not often a business club talk can be described as tasty as well as terrific, but the latest one heard by St Andrews Business Club members at B Jannettas Gelateria on South Street was both! The reason was the speaker, Owen Hazel, who with his wife Nicola has been running the business for the last 20 years. As well as explaining the history of the business — which was started in 1908 by Nicola’s great-grandfather, Bennett Jannetta, as a soda parlour and tobacconist — Owen demonstrated how they make top-quality traditional gelato using a recipe and vertical drum, before giving samples to his eager audience. Earlier they also sampled a fruit sorbet. Owen went on to explain how the fourth generation running the family firm, which won two prestigious awards this year, plan to transform the South Street premises next year into a single open-space ‘gelatorium’, allowing customers to see their ice cream being made. Other plans for the future development of the brand were also outlined, before Owen answered questions. Club President Kenneth Russell, gave a vote of thanks.